You may have wondered how you can make bread crumbs. So often recipes call for bread crumbs, and you may feel like you need to rush out to the store and go purchase some bread crumbs. Did you know you can prepare these at home? How many times have you decided to make a particular recipe that needs breadcrumbs, only to realize that you are out of them? Instead of sighing and rushing out to the store for just one thing, learn how to make breadcrumbs at home. It’s really easy, and, if you make a big batch, you can store them so you’ll never run out again. Breadcrumbs are very versatile – they can thicken sauces, bind together meatballs, serve as a coating for chicken, and make a wonderful filler for quiches and frittatas. Breadcrumbs can also help lighten a heavy dish such as a meatloaf because they give lots of structure but aren’t too heavy. Here are some other ways to use breadcrumbs that you may not have thought of. Breading for appetizers such as jalapeno poppers or mozzarella cheese sticks. Make a great topping for baked macaroni and cheese. Add a little something to a stuffed pepper. Mix with parmesan cheese and use to bread pork chops or chicken (helps the meat to stay moist and not dry out). 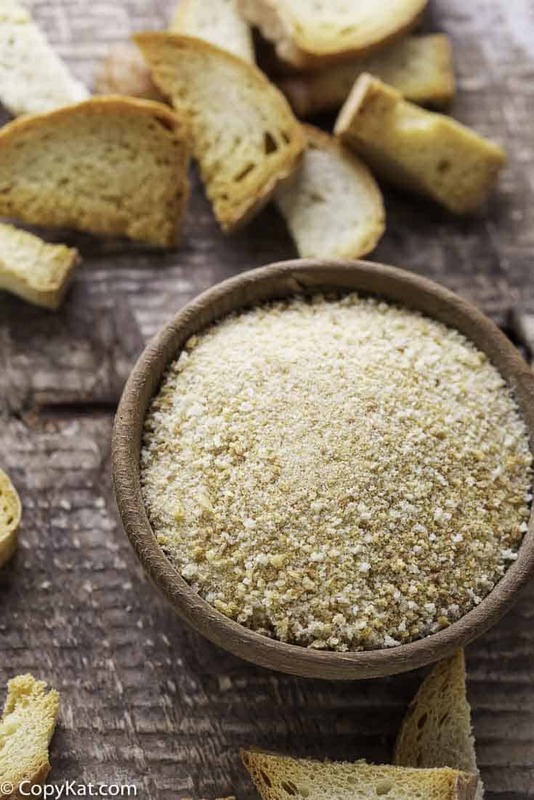 Make Homemade Bread Crumbs In A Snap! When used as a topping, I sometimes like to coat the crumbs with a little melted butter before I sprinkle it onto what’s going to get baked. This way the topping crisps just a bit. Want a way to use up that stale loaf of bread? Turn it into breadcrumbs. I know that store-bought breadcrumbs don’t cost that much, but why not save money where you can? Any type of bread is suitable, and you can leave the crusts on or not as you choose. How Do You Make Homemade Breadcrumbs? All you need is some bread and some spices. It’s really easy – just follow my recipe and instructions at the bottom of this ramble about breadcrumbs. Below are some other questions you may have about making breadcrumbs. How Do You Make Fresh Breadcrumbs? How Do You Make Dry Breadcrumbs? How Do You Make Breadcrumbs Quickly? This will answer all three questions. 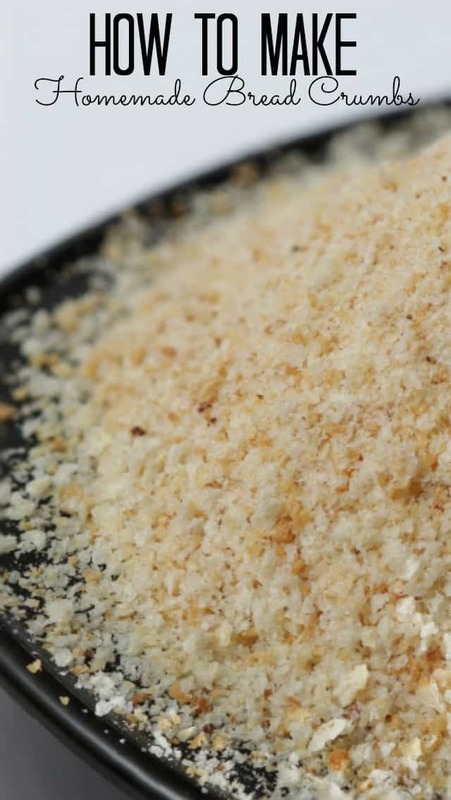 How to make breadcrumbs fast – if you’re in a rush and don’t have the time to follow my recipe, you can make breadcrumbs in about five minutes. This method also tells you how to make breadcrumbs in a toaster and how to make dry breadcrumbs. To make about one cup of breadcrumbs, toast four slices of bread in a toaster or toaster oven until dry but not burned. Let cool then crumble in a blender or food processor to your desired level of crumbliness. I put mine in my Blendtec and blend on speed 9 for 20-30 seconds. Making bread crumbs in the oven takes a long time. It’s much easier and quicker to make them in the microwave. Here’s how to do it. If you don’t want the crust turned into crumbs, remove it. Place four slices of bread on a plate and microwave for 1-1/2 to 2 minutes until the bread is hot and steamy. Flip it over, so it doesn’t stick to the plate, and put back in the microwave for another couple of minutes. When the bread has cooled, just crumble it by hand. If you find any spots that are still slightly moist, just throw them back into the microwave. If you have the time, throwing the bread in a food processor will make fine crumbs fairly quickly. I’m usually in such a rush, getting the thing out is a bother, and I have the bread crumbed using my hands in the time it takes to assemble the processor. This takes a little more time but you end up with breadcrumbs that are homemade and taste delicious. It takes no time at all to make breadcrumbs! Preheat the oven to 250 to 300 degrees F.Lay bread slices on a baking sheet in a single layer. Bake for about 15 minutes, turn the slices over, and bake for an additional 15 minutes. The bread should be perfectly crisp when you remove it from the oven. It should snap when you break up the pieces of bread.Place bread into either a mixer or a blender, and process until the bread crumbs have an even, fine texture.You can season the bread crumbs before storing. You can add some dried parsley (fresh parsley will make the bread crumbs soggy, and make them spoil) or Italian seasoning. I like to add about 1/2 teaspoon of spices to 1 cup of bread crumbs.Store your bread crumbs in an airtight container in the freezer for up to six months. You don’t need to let the bread crumbs thaw before using. That was a good thing to me. Yes, any type of bread. Can shop brought sliced bread be used and do you cut the (edges) crusts off? I leave the crusts on. Is it possible to make bread crumbs from soft tortillas? No need to run to the store and buy store-bought breadcrumbs any more! Love this! For me, it is a great way to use up old bread. I never finish a whole loaf before it goes stale. So easy! Love this! With three little ones sometimes it’s just not worth it to go to the market last minute for one ingredient. Love knowing I can make these at home! I hate to go to the store for just 1 thing, it makes me crazy. I hope you have an opportunity to try other recipes soon. To think I got to ride with the lady who created the baked eggs in avocados. I am the lucky one 😉 Hope to catch up with you soon!